“Avengers: Endgame” marks a turning point for the Marvel Cinematic Universe. Veteran actors are likely to retire from their roles, and it will move beyond “Avengers” as its anchor franchise. Business Insider talked to box-office, media, and comic-book experts about what the future of the MCU could look like, and how it can sustain itself for years to come. After the success of “Black Panther” and “Captain Marvel,” diversity will be essential. Marvel is already developing its first movie starring an Asian superhero, for starters. The Disney-Fox merger and Disney’s upcoming streaming platform provide both new opportunities and challenges for the MCU. He’s right. 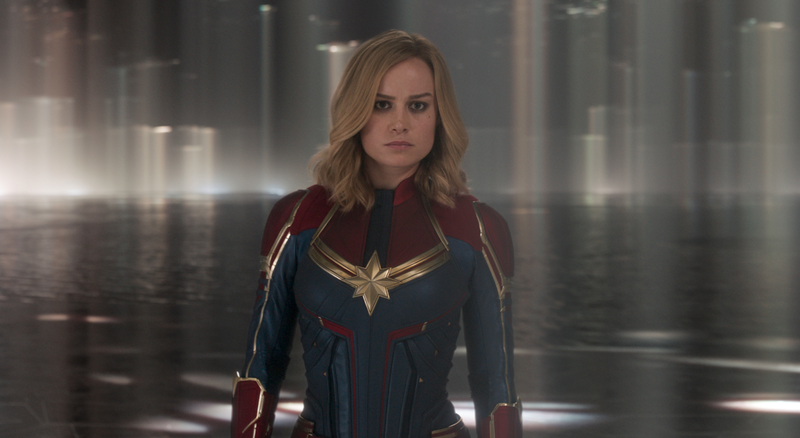 Not long after “Captain Marvel” skyrocketed past $1 billion worldwide, “Avengers: Endgame” hits theaters on April 26. It’s the culmination of those 11 years and is projected to shatter the box-office records its predecessor, “Avengers: Infinity War,” broke last year. And before the dust settles, “Spider-Man: Far From Home” will swing into theaters in July. Some veteran franchise actors like Chris Evans, who has played Captain America since 2011’s “Captain America: The First Avenger,” are expected to hang up their superhero suits after “Endgame” (Evans even joked about the beloved character dying in a recent Hollywood Reporter profile — a scenario that’s not too far-fetched for comic-book readers). Given the amount of secrecy surrounding “Endgame,” not much is known about Marvel Studios’ plans for the MCU after this year. But it does have eight release dates set for yet-to-be-titled movies through 2022, and at least six movies in the works that we know of. A third “Guardians of the Galaxy” movie, which Disney rehired director James Gunn for last month after firing him in July. “Doctor Strange” and “Black Panther” sequels, with directors Scott Derrickson and Ryan Coogler returning, respectively. “The Eternals,” with “The Rider” director Chloé Zhao. “Shang-Chi,” with “Short Term 12” director Destin Daniel Cretton. With the success of “Captain Marvel,” a sequel to that is also likely. And it would be surprising not to see a third “Spider-Man” movie after “Far From Home,” unless Sony, which still retains creative and distribution rights to the character, reverses course. Matthew Ball, a venture capitalist and former Amazon Studios executive who contributes to media analysis website Redef, told Business Insider that Marvel Studios has “clearly landed at least two big hit new stars with built-in audience demand,” Black Panther and Captain Marvel, to lead the franchise going forward. As the first black and female characters to headline their own solo movies in the MCU, they highlight how essential diversity will be for the franchise’s future. Both “Black Panther” and “Captain Marvel” grossed $1 billion worldwide. Marvel Studios’ production head Victoria Alonso told Variety last month that “the world is ready” for a gay superhero in the MCU, and “The Eternals” is reportedly being led by a gay character. And Shang-Chi will be the MCU’s first major Asian superhero. The Disney-Fox merger finally closed last month after Disney bought Fox for a whopping $71 billion last year. Disney now owns Fox’s film studio, many of its television assets, its stake in Hulu, and the film rights to Fox’s Marvel characters like the X-Men, Fantastic Four, and Deadpool. On top of the merger, Disney is launching a streaming service later this year called Disney+, and Marvel TV shows spinning off of the MCU are already in development (a Loki show starring Tom Hiddleston has been announced, and others, like a Scarlet Witch series, have been reported to be in the works). While the prospect of the X-Men and Fantastic Four joining the MCU is an intriguing one, there are many big questions that have yet to be answered. How will Marvel usher in these new characters? How long will it take? Will audiences be confused? Is it willing to take the risk on the Fantastic Four? Fox made three “Fantastic Four” movies in 10 years, none of which were resounding success stories. 2015’s reboot, again titled “Fantastic Four,” made just $56 million in the US. If that sounds like a long time, consider that 10 years separated “Iron Man” and “Avengers: Infinity War,” and there’s an “X-Men” movie coming to theaters this summer — “Dark Phoenix,” likely the last of the Fox “X-Men” movies that will hit theaters (a spin-off movie called “The New Mutants” is scheduled for release in August, but is currently in limbo). And in the meantime, it’s plausible that Marvel would sprinkle the former Fox characters throughout upcoming movies, or even use Disney+ as a starting point, especially if Scarlet Witch (played by Elizabeth Olsen) actually stars in her own series. In the comics, Scarlet Witch is a mutant and the daughter of X-Men villain, Magneto. Because Fox owned the X-Men film rights, Marvel Studios couldn’t use the term mutant … until now. For comic-book readers, that would be an exciting, but not shocking, revelation. The MCU has regularly used major comic storylines as inspiration, from “Captain America: Civil War” (based on the 2007 Marvel Comics event “Civil War”), to “Thor: Ragnarok” (the Hulk’s storyline is heavily inspired by “Planet Hulk”), to “Infinity War” (the Thanos snap that wipes out half of humanity at the end of the movie occurs in the 1991 comic series, “The Infinity Gauntlet”). But Betancourt thinks it’s time for the MCU to move beyond the comics. Franchises dominate the moviegoing experience these days, but the MCU is the only one that has landed on a winning formula where it can deliver up to three movies a year, and all of them are box-office successes. The MCU has experienced no such speed bump, and has only grown over time. 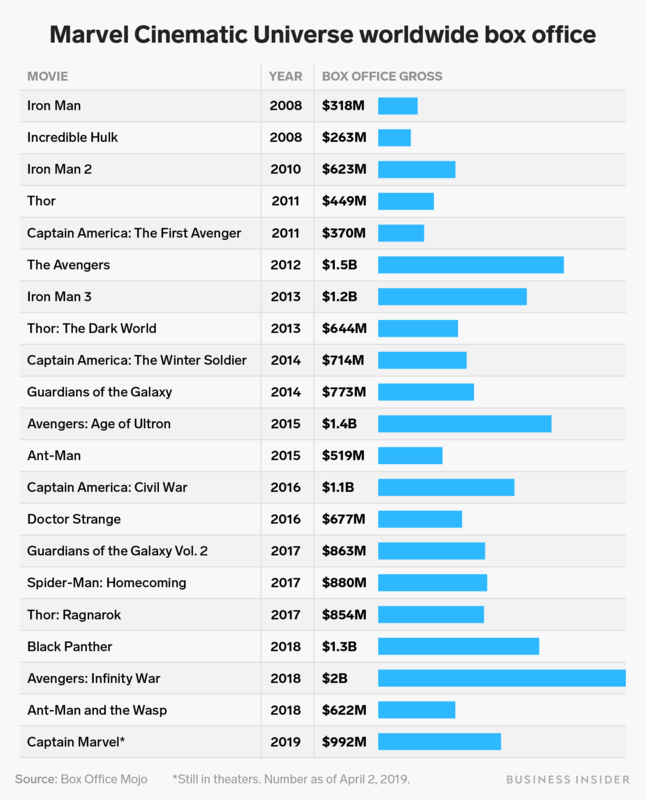 Seven of the nine MCU movies released since 2016 are among the franchise’s top 10 highest grossing movies worldwide. That’s why consumers shouldn’t expect Disney, which distributed the top three highest-grossing movies of 2018, to focus less on cinemas, even as it launches Disney+. Striking that balance could prove to be challenging, though. Marvel Studios has perfected its big-screen cinematic universe, but this is Disney’s first jump into the streaming game. It will be integrating Fox assets at the same time, something that Barclays noted as a potential challenge for Disney’s streaming aspirations in an October report. “The company’s pivot [to streaming] will happen during what is likely to be a complex integration culturally between Fox and Disney,” Barclays analysts said. But experts say the MCU will overcome potential hurdles, if it continues to play its cards right.